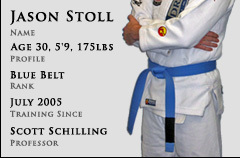 Today I had my first private Brazilian Jiu Jitsu lesson with Professor Schilling. I can not express how valuable this hour was. We first had a discussion about my training and experience. This talk time was a great opportunity to share some feedback, ask questions, and discuss the upcoming lesson. We then did a quick review of the curriculum with a review of the first stripe elements (I am currently a first stripe white belt). This first stripe review was good because we do not always have time re-visit every technique in class. So the brush up was nice. We then took out the second stripe curriculum which formed the basis of the lesson. We started with stand up self defenses which were a good warm up. We then moved on to the other elements; I will not discuss them all as there are too many to list. The constant feedback, corrections, and attention to detail by Professor was extremely valuable. It only makes sense to have a private lesson every month or two. There is a lot of information offered in every class, but it is essential to focus on belt level curriculum and/or personal deficiencies to improve in Brazilian Jiu Jitsu. There is simply not enough time to get this essential info or feedback in class. Private lessons are a valuable resource to take advantage of for personal development in Brazilian Jiu Jitsu.